We hope you like them in the same way we did. 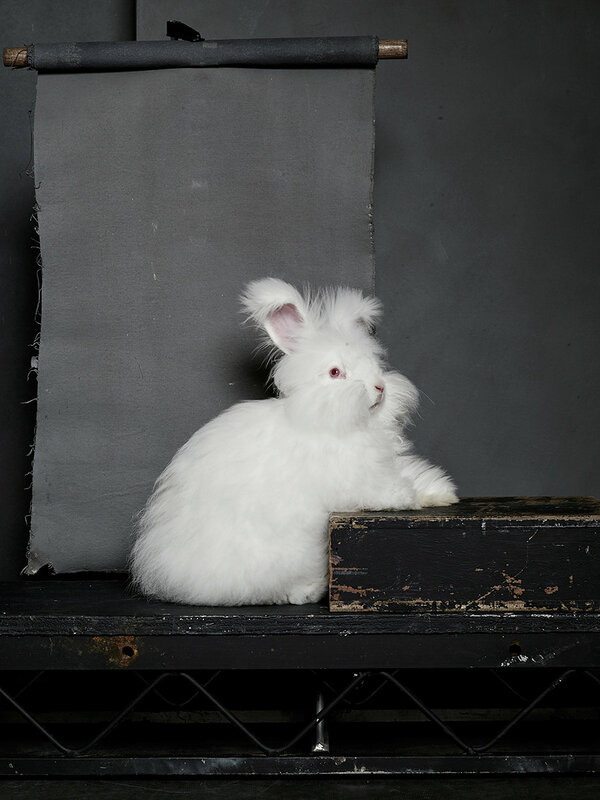 Hufflepuff, or “Puff,” is a striking white rabbit and one of several big Angoras to emerge from New Jersey. Puff walks in rabbit shows once or twice a month. Molly, left, and Autumn, right, are Holland Lops from Bedford, New York. Molly loves the camera, showing off her orange spots every chance she gets. Autumn is shy, seemingly uncertain of the white streak on his face. 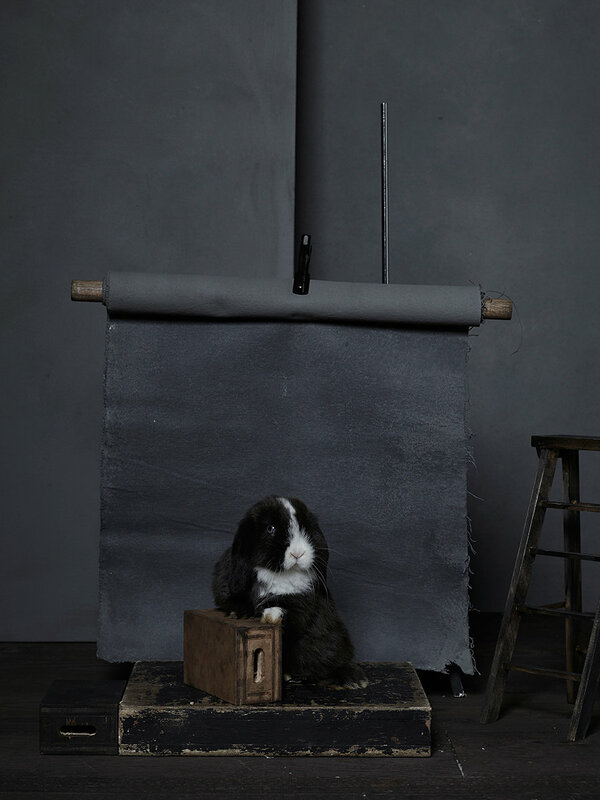 This is not Molly’s first shoot, as you can see in the relaxed paw placement and practiced smize. 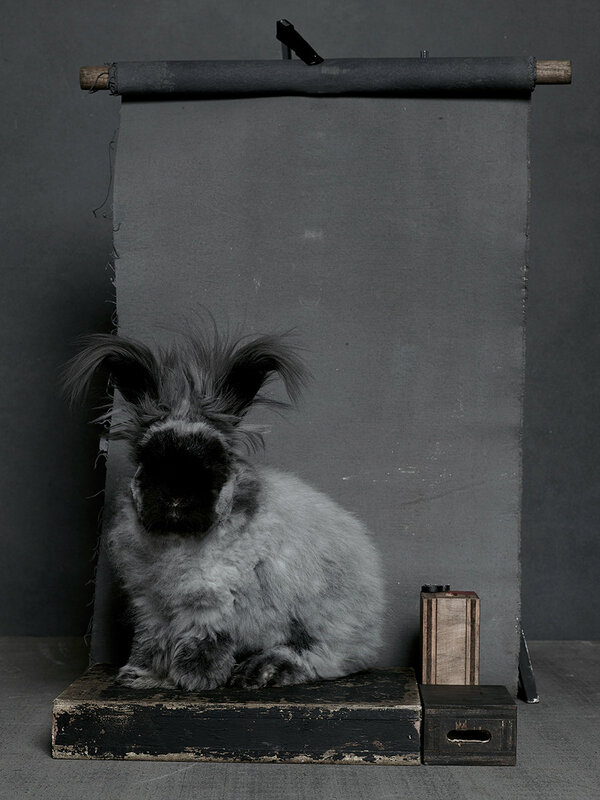 Andaz is a spunky young Dutch rabbit who, when he’s not running around or lounging on top of air conditioning vents, can be found relaxing in a Superman pose, paws outstretched. He swears by an all-greens diet of organic cilantro, Italian parsley, and dandelion. Mon, left, and Choobie, right, are a bonded pair. 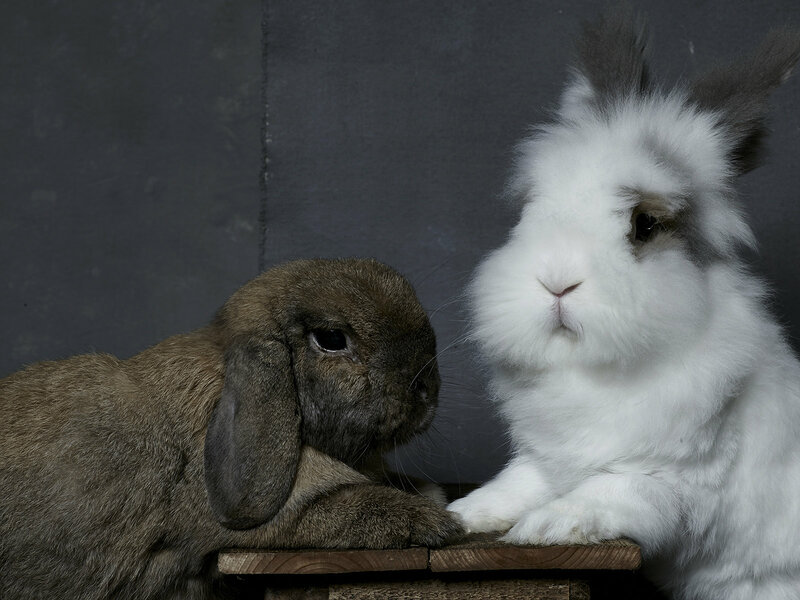 Mon was the first rabbit from New Jersey to hit it big and, with his prominent forehead and long ears, has been credited with popularizing the Lop look. 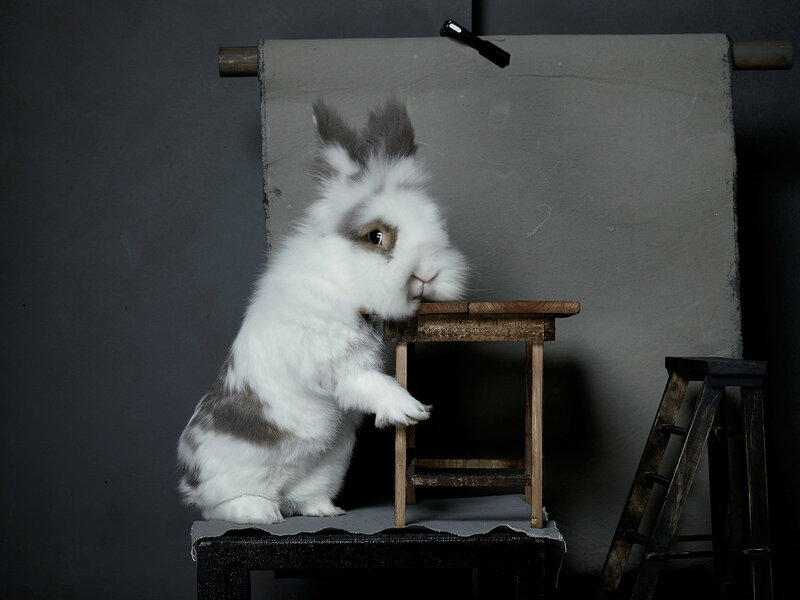 Choobie, a Lionhead mix from Virginia, has a signature white fluffy head and ears that point up. Choobie was missing a tooth when he was first discovered. His is a classic rags-to-riches story. 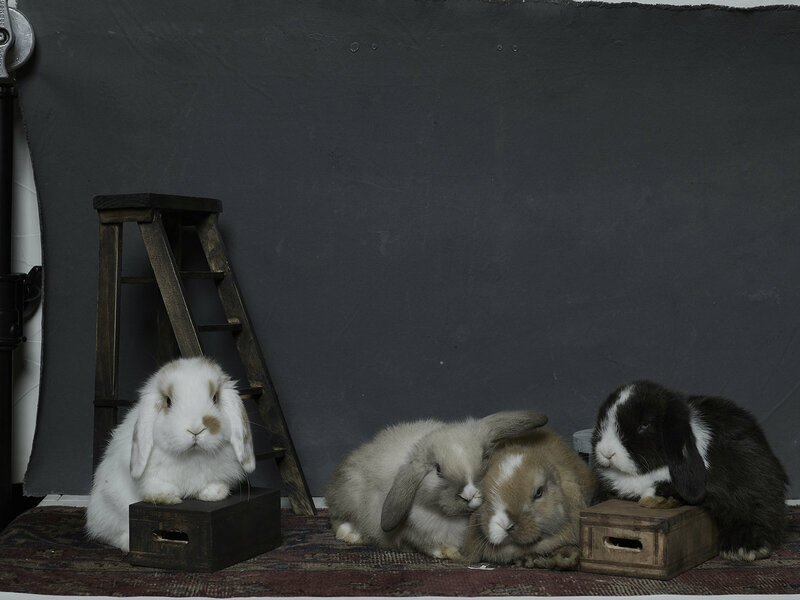 Here, Molly and Autumn are joined by Oscar, far right, and Biscuit, the dusty gray brunette second from left, for an iconic group portrait. Coordinating their busy schedules to get this shot—you have no idea. 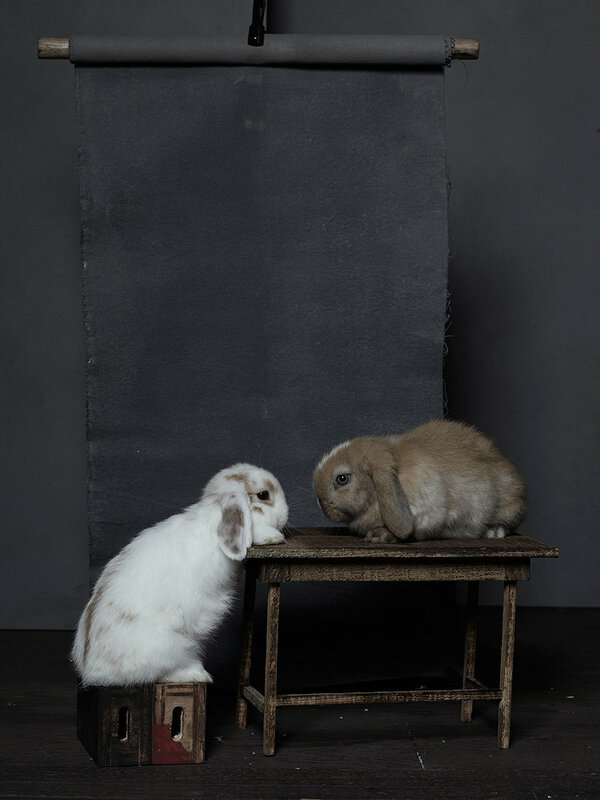 Puff is joined here by fellow show rabbit Slytherin, another Angora from Jersey. 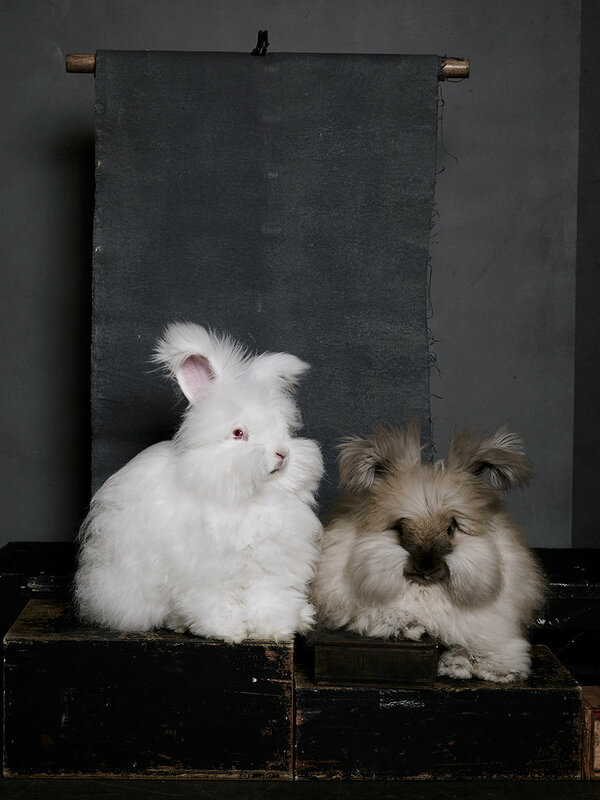 Both use a high-powered blower, never a brush, to keep their coats fluffy. Oscar is a member of the Holland Lop tribe out of Bedford. 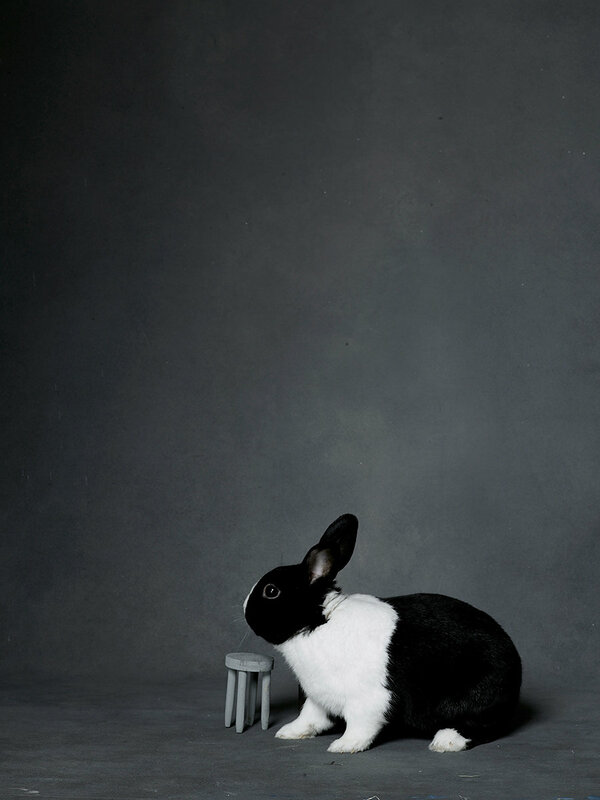 He was the first cover rabbit with black fur, a white face streak, and blue eyes—an unusual combination of features. An undeniable star, Kablooie, a titanic brown Angora from the Jersey scene, also came up through the show circuit. Kablooie’s features are so feline that on the street, he is often mistaken for a cat. 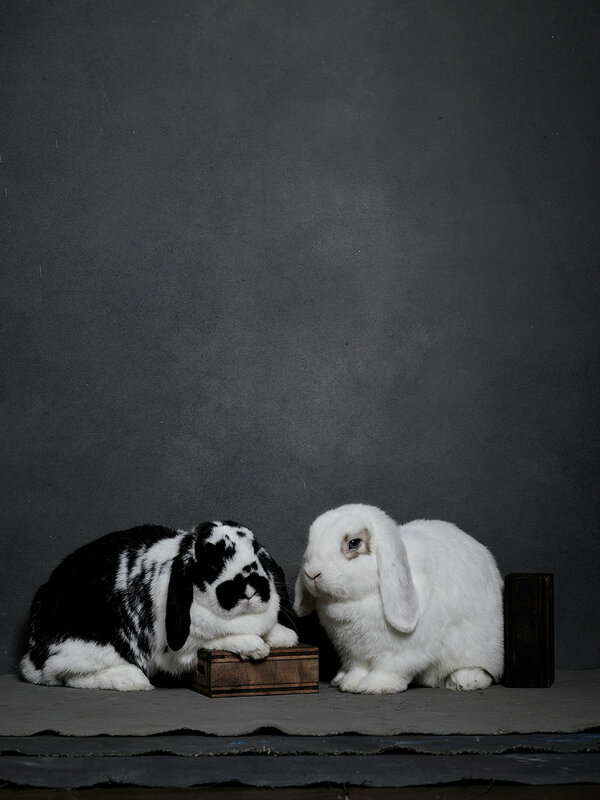 Crimson, left, and Clover, right, both French Lops, have been besties since their Staten Island days, and can often be found grooming each other. Crimson is the more outgoing, frequently seeking pets from humans, while Clover prefers to get his cuddles from Crimson. They are partial to hay. 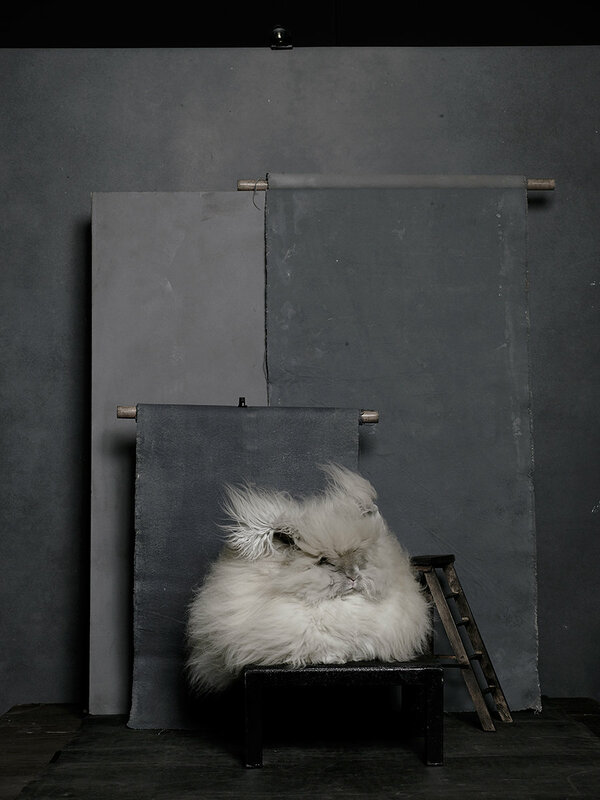 Merlin, a gray Angora from upstate New York, has garnered a loyal following with his many editorial appearances and popular Instagram feed, @Merlin_Manhattan, where he posts snaps of his life hopping the floors of the office. He loves digging imaginary holes, nibbling on The New York Times, and chewing on dried mango. 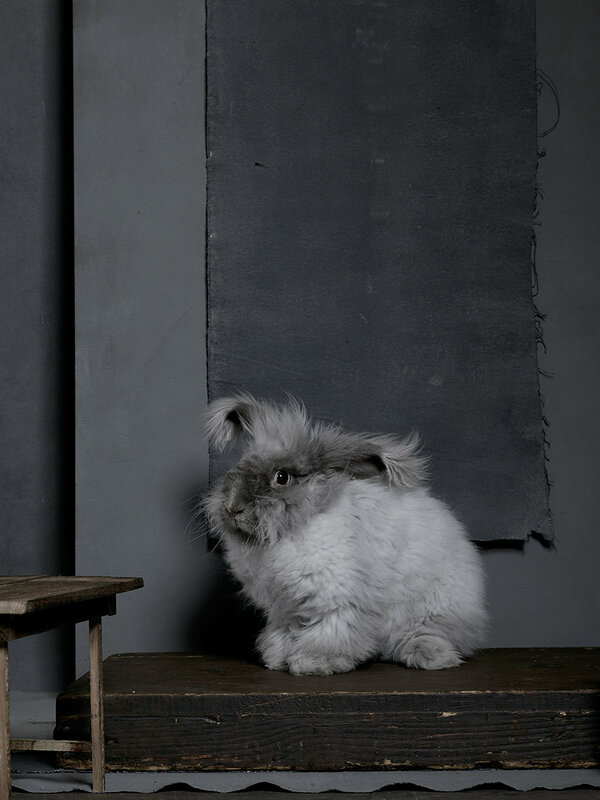 Entity, “Tiny” for short, is an exceptionally smart Dwarf Angora. (He knows his name.) 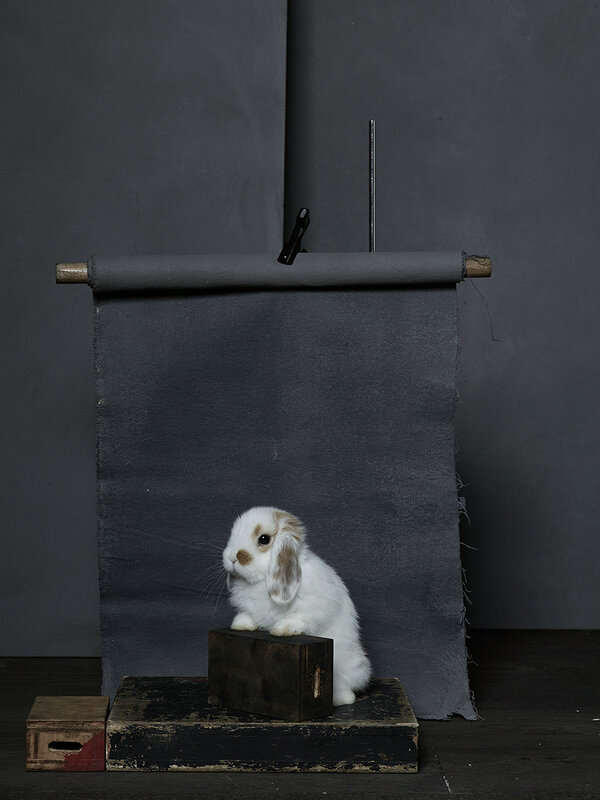 A show bunny, Tiny has enjoyed many big wins, including a title at the National Jersey Wooly show. He is known to indulge in shredded Mini-Wheats. 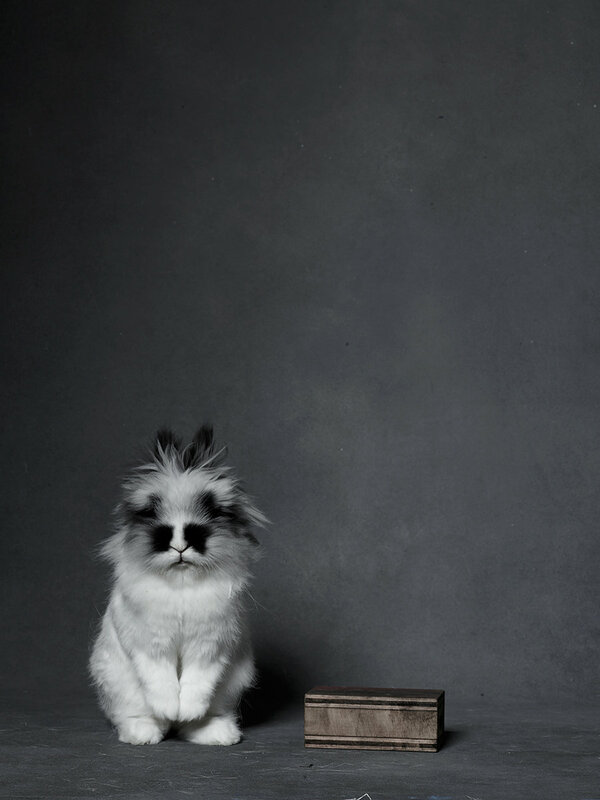 Louie, a young English Angora from Yonkers, is known for his refined aesthetic sense. When he’s not hopping around his room, he is usually rearranging the positions of his litter boxes and toys. He prefers to eat arugula. 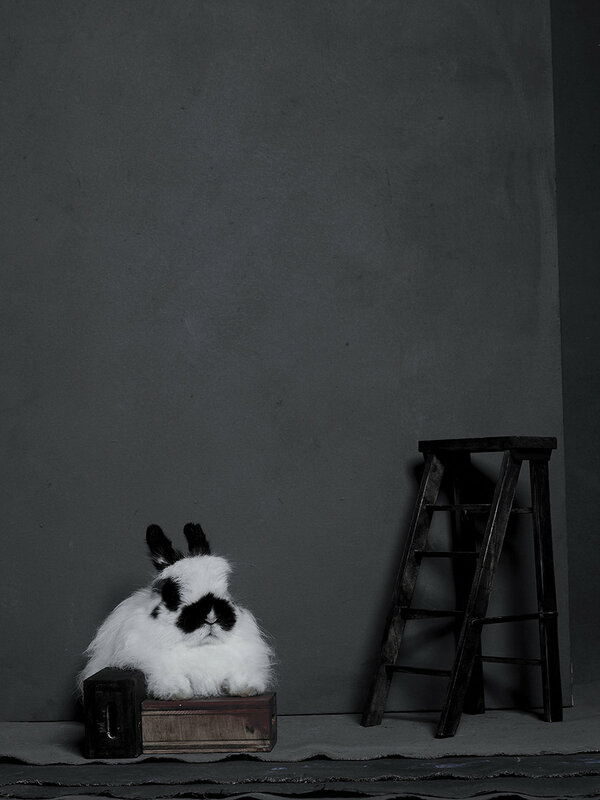 Mr. Spock, a Lionhead from Westchester, is a petite black-and-white rabbit with a fluffy head and wide-set eyes. Though he is small, his personality is big—he can be a bit of a diva, leaping into laps and demanding head rubs. He sticks to a diet of hay and fresh greens.